Power surge from Audi | News by Wales Express News, People Before Profit! Audi Sport, the company’s high performance team, has been beefing up models right across the range with new engines pumping out incredible power. And the appetite for cars that look like every day family transport but go like stink is growing. Audi is selling more models with the RS badge than ever and the performance is mind boggling. Take the RS 3. 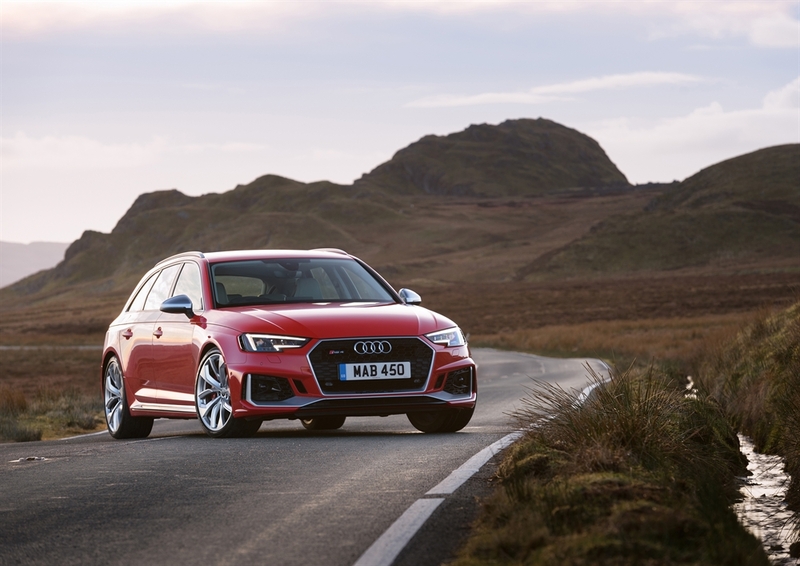 In normal A3 guise this is a medium sized family saloon, but change its clothes and it is a super car pumping out nearly 400bhp and cracking sixty in four seconds. And it is ditto for the new RS 4 Avant, one of the fastest estate cars on the planet, the RS 5 Coupe and the SQ 5 SUV. Why are super quick cars selling so well when the fastest we can go is 70mph? It comes down to bragging rights, knowing your car is the fastest on the car park, and getting an adrenalin rush with a sneaky spin on a quiet road. And some owners will take their speed machine to a race circuit where they can burn rubber in relative safety. There is also the rivalry between the ‘big three’. Audi, BMW and Mercedes-Benz are in a constant battle to outgun each other. Tenths of a second count in accelerating to the magic 100kph – that’s 62mph to us Brits – and the margins are always incredibly tight toing-and-froing between one model and another. Audi has burst into 2018 with two new petrol engines, a 2.5litre, 392bhp five cylinder, and a 441bhp 2.9 litre V6. The V6 is dynamite and powers the RS4 Avant and RS 5 Coupe. It is a twin turbo unit gushing with acceleration at any time and in any gear. Compared to the previous engine the new V6 boasts a staggering 600Nm of torque (we put up with less than 200Nm in our family runarounds) and up a full 170Nm on the outgoing models, and they were no slouches! Is this amount of power two much for our roads? Undoubtedly. But remember what I said about bragging rights, and not every country is as strict as us with speed limits. There are no limits on some German autobahns so that is place to test the 174mph top speed. Out of all the Audi range, which now numbers 53, the quattro driven RS 4 Avant has always been my stand out model because here real world driving and practicality meets extreme performance. If only I had £62k to spare. And then there is the emotional tie to the RS 5 Coupe, the spiritual successor to the iconic Audi quattro, the car that gave the compant two world rally championships in the eighties and nineties and set it on the road to success. As well as more power and overtaking punch from the new engine, some of the performance gain is down to a rigid diet. This all wheel drive beauty has shed a full 60kg yet its body is stronger than the model it has replaced. Other powerhouse highlights include the monstrous SQ7, Audi’s largest SUV, for now, whose 4-litre V8 diesel packs three turbo chargers and pumps out – wait for it – 900Nm or torque, a third more than the RS4 Avant. Where is it all going to end? It needs all the help it can get against the luxurious Range Rover, not to mention the beautifully crafted Volvo XC90. You will need £74,000 to nab the SQ7 which is cheaper than a Range Rover. We must not forget the new TT RS Coupe which is getting ever closer to the ultimate Audi, the R8 V10, in terms of performance. Here the 62mph landmark takes a mere 3.7 seconds so don’t take it on at the traffic lights unless you are driving a Porsche 718 Caymen although you will be a bonnet length in front by the time you reach sixty! Want one? Sorry there is an 11 month wait so plenty of time to save up £52,000. Audi is in the middle of a 24 billion Euro investment in new product and the next year is going to be busy with 21 new models one of which will be the Q8 which we are told will be longer but lower than the Q7. And there will be an electric car with a range of 300 miles.